Enjoy Free Shipping on this item when you enter code FRESH at checkout. *Discounted Items Excluded. See details. 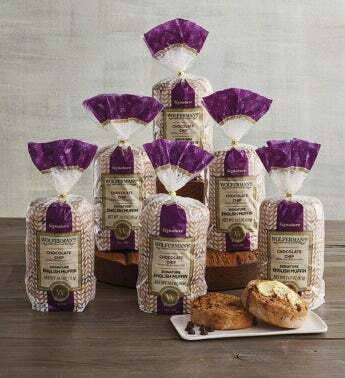 Chocolate chip signature English muffins are a masterful combination of our tangy English muffin bread and mouthwatering pieces of semi-sweet chocolate. Created with our world famous recipe, our extra-thick signature English muffins have an ideal crispy texture when toasted and wonderful air pockets to hold your favorite toppings. Our gourmet English muffins are freezer-friendly, so stock up on your favorite flavors. Kosher.